It’s a special time on the Reserve that all the Guides look forward to. Those who have become accustomed to the slight seasonal changes in our ecosystem know that November 15th is a significant date. If you’re on Safari at Nambiti Hills, you’ll notice that the rains have brought with them, new lush greenery. With the abundance of food readily available, now is the time that you will see hundreds of nurseries with young, suckling herbivores. As they are preyed upon by many predators on the Reserve, herbivores tend to give birth at the same time, to ensure a higher survival rate for individual babies. Wildebeest, warthog, impala and the like, are clouding up the air with the smell of new-borns. This is no coincidence. 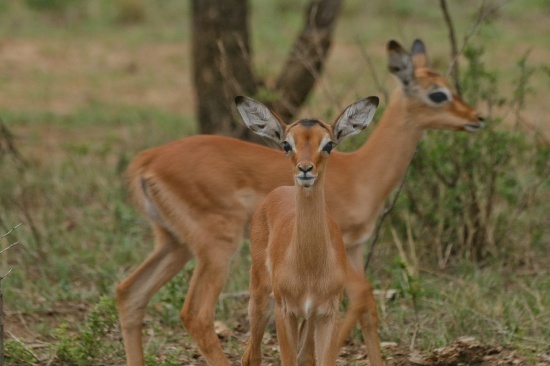 In fact, this is just one of many ways impala ensure their survival. With an estimated number of over 2 million impala in Africa, they are one of the most successfully bred animals in the African wild. The rut (breeding season) begins in May, over 3 to 4 weeks, usually taking place between two full moons. In the Southern Hemisphere, this is toward the end of autumn, and most importantly, the end of the rainy season which provides lots of nutrition for expectant mothers. After a gestation period of 6 to 7 months, the majority of females in the herd will begin to give birth within quick succession of one another. Birthing usually happens at midday, in broad daylight, to protect the female from predators at night. 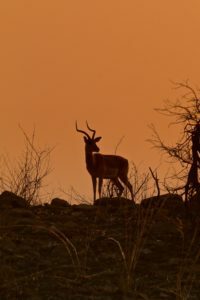 Once labour pains begin, a female will isolate herself from the herd in a shaded thicket, as she is vulnerable, and does not wish to threaten the safety of the other antelope. The timing of the birth also takes place during predator’s least active time of hunting. Straight after, the female impala will lick her calf, cleaning off the “birthed” smell to make sure it will not draw the attention of lion or other nearby threats. 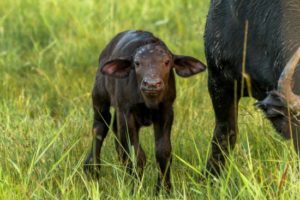 The birthing of such high volumes of calves within such a short period of time, ensures that at least half of the calves born will survive. 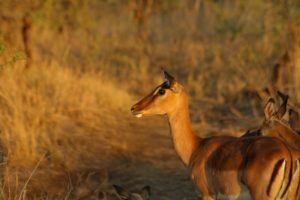 Being a highly favoured prey, the mother and calf bond is not strong within impala – parting happens all too often – and after a suckling season of about 6 months, female calves remain behind in the nurseries, while males will move on to join bachelor herds, and the process starts again.